Jive WorkType(s)™ is a trademarked feature that Jive Inc. launched in October 2014. 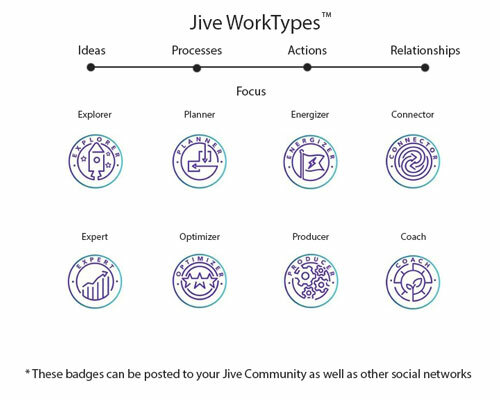 Jive Worktypes™ are designed to help community members collaborate together better by understanding each person’s unique work style. Have you ever worked with someone who performs his or her job-related duties and tasks in a completely different way than you? Jive Inc. asked their employees the same question, and the answer the Jive Team ultimately came up with might actually surprise you — Jive WorkTypes™. Jive Inc. believes that technology should be optimized and built around the needs of an individual as opposed to taking a mass approach by developing/delivering products that work for most but not all people within an organization. Since WorkTypes™ is a new feature provided to Jive employees and customers, during this initial phase, community members will be able to determine their WorkType™ and share the results on their Jive profile page as well as on third-party profile pages such as Facebook, LinkedIn, and Twitter. After you’ve completed the assessment in the Jive WorkType Finder section of the Jive software you automatically receive a monthly newsletter from the Jive team that provides you with work-style specific practices, tips, and tricks to help improve your regular routine. The assessment can take a long time to complete, and the questionnaire session will timeout/expire and close if you try to do it in little chunks in-between your regular duties. If your session expires, unfortunately, you will have to start over again from the beginning. Instead, try to have time set aside to complete the questionnaire in one swoop to avoid any issues this piece of software might give you. Explorers — Explorers like to provide new ideas and fresh perspectives on the everyday tasks presented to them. Experts — Experts like to help solve the toughest of problems. They often have a need to always be correct. Planners — Planners like to streamline what tasks need to be done and how to best complete the task in question. Optimizers — Optimizers like to increase efficiency and production by optimizing organization for each task from the ground up. Energizers — Energizers like to achieve the impossible by going above and beyond and always maintaining an upbeat attitude. Producers — Producers strive to deliver results by turning their vision into a reality. They will do whatever it takes to get the results they desire. Connectors — Connectors thrive on the social aspects of work. They like meeting new people and bridging gaps. Coaches — Coaches bring out the best in people and often strive to be the “go-to” person or person in charge. When creating a group of team members, try to choose 1 or 2 people from each WorkType™ category. This not only will prevent unnecessary conflict, but will also create a more efficient work environment for everyone.